You can also download this article in PDF format by clicking here. Name: Erich "Bubi" Hartmann...aka "Karaya one"
Victories: 352 total, seven P-51s over Rumania( Ploesti), all others Eastern Front, all in Bf 109. "Of all my accomplishments I may have achieved during the war, I am proudest of the fact that I never lost a wingman"
ERICH HARTMANN, the world's top-scoring fighter pilot, shot down the equivalent of almost 15 Allied squadrons in aerial combat.The Russian pilots both feared and hated him, and called him the "Black Devil of Ukraine". Flying 1 425 missions over the Caucasus, southern Russia, Romania, Hungary and Czechoslovakia, Hartmann engaged in over 800 dogfights and sufferd 16 accidents or equipment failures. Hartmann was only 17 when the war began. He was born in Weissach, Wurtemberg on April 19,1922. He was the son of a physician and his mother, a brilliant sportswoman was a pilot and an aviation enthusiast. Erich's life was quite adventurous already in his early childhood. A cousin of his father, while on a visit to his homeland - at the time he was Germany's consul in Shanghai - advised the young doctor to leave the hyperinflation, food shortages and political and economic chaos of Germany behind him and come to China. Wanderlust took over the young doctor, he went to China and remained there. Erich's father opened his practice in the city of Changsha on the Xiang, a tributary of the mighty Yangtsee Kiang river. He was the only white doctor in the city and was held in high regard and was well paid by the Chinese. This allowed his wife and two boys Erich and Alfred to later follow him. There was a beautiful island in the middle of the Xiang river, which his father bought to himself, and built a house there. For the boys the island was a little paradise, that imposed no limits to childhood fantasies. Erich has told that the good memories of that place haunted him for decades. The boys learned to speak chinese during those years. But the idyllic life in the far east was not to last. Revolutionary slogans and attacks against the "foreign Devil" became stronger and stronger. Germans anyway remained unmolested, because their government was not involved in the disputes. One morning Dr. Hartmann made his way into the town and found the severed heads of many of his English friends stuffed to the fenceposts along the road. He took the only logical step available, and sent his wife and boys back to Germany via the Trans Siberian Railroad. Dr. Hartmann returned to Germany about an year later, and made his home and practice in the vincinity of Weil im Schönburg. His house had a roof that looked like a Chinese pagoda. Erich's mother taught him to fly, and at the ripe age of 14 he had earned his glider pilot "C" license. He flew powered plane two years later. Erich's real goal in the life was becoming a doctor like his father, but the currents of the world politics decided otherwise. Upon graduating from college in late 1940, after alredy passing the university entrance examinations, he joined the army, transferring to the Luftwaffe six months later. All the time he loathed the military drill, and could only bear it because of his love to flying. An adept pupil, he soloed in less than one month, but experienced three crash landings during the training course. Hartmann reached the front at the age of 20 in late 1942 and didn't fly during the easy years of 41' and 42' in the East. By October, 1942, he was assigned to 7/JG 52 based in Soldatskaya in the Caucasus.Erich was assigned as Rottenflieger(wingman) for major Walter Krupinski. If it wasn't for his instructor, and leader Krupinski, Hartmann might very well have quit being a fighter pilot. Hartmann actually volunteered to be sent to the infantry due to his bad performance. Luckily for the Luftwaffe (and unluckily for the Russians) Krupinski believed in Hartmann and his abilities. Krupinski took the youngster in tow with a relaxed combat attitude.He taught Erich to get so close to his adversary that a hit was guaranteed before firing. This lesson, coupled with the fact that Hartmann was a crack shot, enabled Erich to score most of his hits with very little ammunition use. "Bubi" Hartmann scored his first victory, a Shturmovik, on November 5, 1942, but lost his plane as the Il-2's rear gunner's 12.7mm Brezin hit his oil-cooler. By September 18, 1943, Hartmann had completed 300 missions with 95 victories to his credit.On October 29, he was awarded the Ritterkreuz(Knight's Cross Of the Iron Cross) for his 148th victory.He was now Staffelkapitan of 7/JG 52, and recipient of the Eichenlaub(Knight's Cross with Oak Leaves) on March 2, 1944, for his 200th victory.With his combat style fully developed, Erich Hartmann rode the crest of success in the summer of 1944.After receiving the Schwertern (Knight's Cross with Oak Leaves and Swords)on July 4 for his 239th kill, he scored 59 victories in 16 missions, and downed 78 Soviet aircraft in four weeks.He shot down 8 adversaries on August 23, and eleven more the following day for a total of 301 victories! Oblt. Hartmann was awarded the Brillanten (Diamonds) to his Ritterkreuz on August 25, 1944.By that time 7/JG 52 had shot down 1,200 Soviet aircraft, more than any other Staffel in the Luftwaffe. Before the decoration ceremony for his diamonds, he was demanded to hand away his sidearm before the meeting with Hitler. Hartmann told the generals , that if Hitler could not trust his front line officers, he could as well stuff his diamonds into… After a brief confusion he was allowed to carry his pistol. 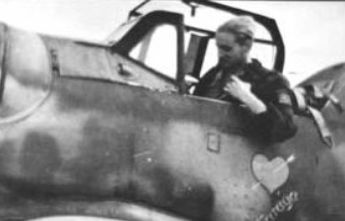 Hartmann was transferred to the leadership of 4/JG 52 in October, 1944, and advanced to Gruppenkommandeur of I/JG 52 on February 1, 1945.His score continued to mount, despite the fact that most Russian pilots turned and ran when they saw Hartmann's "Black Tulip" Messerschmitt approaching. Erich's tactic was to strike quickly, getting as close as possible before firing, and then "hit and run", using the Messerschmitt's excellent climbing ability to advantage. Then he would repeat the process, taking advantage of his plane's good acceleration in dive .Unlike Hans Joachim Marseille, Hartmann hardly ever scored multiple victories in a single pass.Bubi generally looked for a high cloud behind which to hide between attacks.His tactics were not unlike those of Manfred von Richthofen, the top scorer of the First World War. 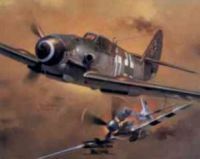 In the late morning of May 8, 1945, Hptm.Hartmann led the Schwarm(flight) over Czechoslovakia to spot the advancing Russian troops.He saw a Soviet Yak fighter performing aerobatics over the town of Brunn, apparently in celebration of the pending Russian victory.Erich struck quickly and the hapless aerobat became his 352nd victory. After surrendering to the Americans at Pisek, Hartmann was turned over to the Russians by the U.S. authorities.Once the Soviets realized that they had the Black Devil as a prisoner, he was singled out for especially brutal treatment, including long periods of solitary confinement in total darkness.Using every persuasive device known, the Russians could not convert Hartmann to Communism, and get him to join the airforce of DDR. After a mock-up war-crime trial Hartmann was held in prison for ten years, far longer than the other POW's.While he was illegaly detained in Russia, Hartmann's 3 1/2-year-old-son, whom he had never seen, died. It was only after Chansellor Adenauer personally visited Moscow in 1955 and arranged for his release that a gaunt and haggard Erich Hartmann was released by his captors, broken in body but not in spirit. Hartmann quickly regained his health and joined the new West German Air Force in 1959, becoming Kommodore of JG 71, the new Richthofen Geschwader based at Fliegerhorst Ahlhorn in Oldenberg. JG 71 was the first of the new Geschwadern formed by the Federal Republic's air force. After his negative recomentation to the German Air Force about the F-104 Starfighter and his dispute with General Kammhuber Obstlt. Erich Hartmann fell from favor.Unfortunaly for him, he gave direct answers to people who asked him direct questions and he backed his opinions.Through the grapevine, his views about the F-104 made their way up to the high political circles and fueled the already wide-spread belif that he was not the man to be considered for special positions of leadership.That the F-104's fell from the sky, and in surprising numbers, did not change things for him. He had been tripped up. Even though he was acquited of investigations and hearings which resulted from bureaucratic trivialities, he was sent to a staff position near Cologne. In 1968 at the energetic recommendation of his old friend General Gunther Rall, he was finally promoted to Oberst(Colonel).On September 30, 1970, Erich Hartmann voluntarily retired from active service. On a grey day in 1993, Oberst(ret) Erich Hartmann lost the ultimate battle of his life.An illness that had troubled him before in late 70's, and originated back to his 10 1/2 years of hard labour inprisonment in Russia, finally beat him. "Rossmann called out some enemy aircraft over the radio, and started to dive. I followed. I myself could not recognize any enemy aircraft at first. As we leveled out at high speed, I discovered two dark green airplanes about 2000 meters in front of me and slightly higher. My first thought was: I'm going to get one of them! I gave full throttle and shot past my rotte leader to get into firing position. I approached quickly, and opened fire at about 300 meters. I noticed how my shots went past the target, high and to the left. The target in front of me became bigger so quickly, that I had to pull back on the stick and climb. I was immediately surrounded by dark green airplanes, which were turning in behind me. Now I was getting nervous. I had lost visual contact with my rotte leader, climbed up through a cloud layer, and was suddenly alone. Then Rossmann's voice came over the radio: "Never fear, I was watching you; I've lost you now. Come down through the cloud deck so I can see you again!" I emerged from the cloud and saw an airplane at a range of about 1200 to 1500 meters coming directly toward me. I stared in fright and initiated a fast descent toward the west. I called my leader and reported that there was an unidentified aircraft on my tail. Rossmann's voice came back: "Turn right so that I can come closer to you". I turned to the right, but the plane cut inside my turn . I banked as hard as possible. Full throttle, descend to low-level flight and then off in a westerly direction. I could no longer hear Rossmann's words, pulled my head in behind the armor plating and waited for the crashing impact of enemy bullets in my airplane. The other airplane was still behind me. After a while I heard Rossman's voice again, saying me that there was no longer an airplane behind me. I climbed to altitude to determine my position. To my left I saw the Elbrus river and could now find my way. Then I saw the red warning light for fuel light up. Five minutes later the engine went bong-bong-bong and stopped. I had no more fuel. Below me there were huge sunflower fields and a road on which a couple of trucks were driving. The ground came up quickly. I made a belly landing in a violent cloud of dust, opened the canopy and took my personal gear out of the cockpit. Some army chums drove me the 30 kilometers back to Soldatskaya airfield. 1. Breaking from the wing leader withouth being ordered to. 2. Flying into the firing line of the wing leader. 3. Climbing through the cloud deck. 4. Confusing the wing leader with an enemy aircraft. (The "enemy" from which I dove away after descending through the clouds was Rossmann). 5. Failure to follow the order to assemble. 7. Loss of my aircraft withouth having inflicted damage upon the enemy. I was grounded and subordinated to the ground personnell for three days. I felt awful. " Take notice: the concensus on this story seems to be that it is not authentic. If the story is real, it was not Hartmann that Thompson met. It is a good read, neverthless. This article is copyright Virtuaalilentäjät r.y. / Finnish Virtual Pilots Association 2001. Article written by Pentti "Buffalo" Kurkinen.